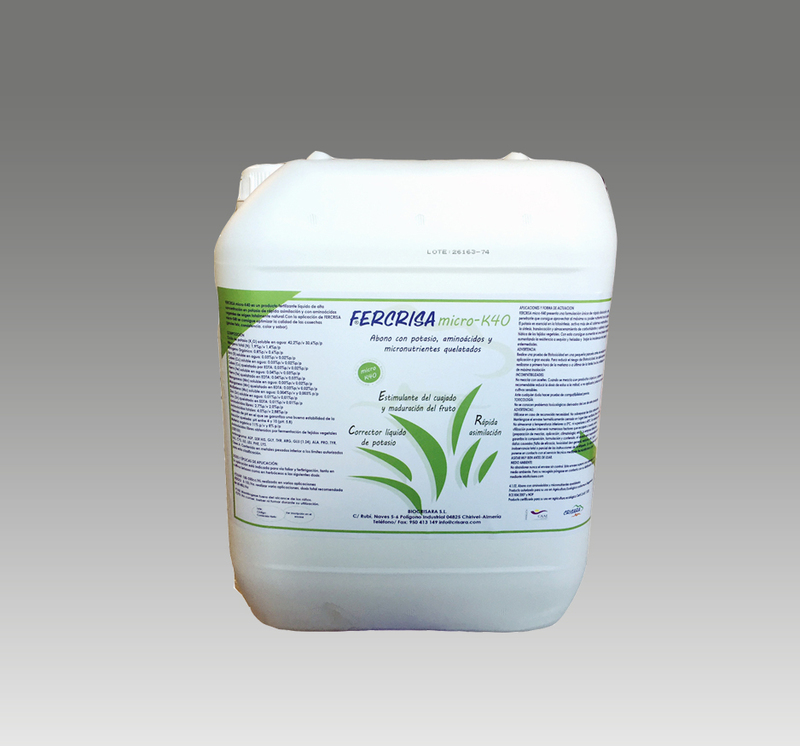 Liquid fertilizer of high concentration in potassium of fast assimilation and with vegetal amino acids of totally natural origin. With the application of Fercrisa micro-K40, it is possible to optimize the quality of the harvest (brix degrees, consistency, color and flavor). Its application is recommended during the fruiting stage, promoting the flocculent translocation of sugars from the photosynthetic organs to the fruits. Its mixed formulation with potassium and natural organic stimulants promotes the activation of the fast and efficient metabolism of potassium in the plant. Intervalo de pH de estabilidad de la fracción quelatada: 4-10. Aminograma: ASP, SER HIS, GLY, THR, ARG, GLU (1,24), ALA, PRO, TYR, AL, CYS, ILE, LEU, PHE, LYS.